The 12 remaining players will play four more hands before bagging up their chips for the night. Tom Marchese raised to 28,000 before the flop and Hoyt Corkins reraised to 100,000. Marchese then made it 208,000 total. 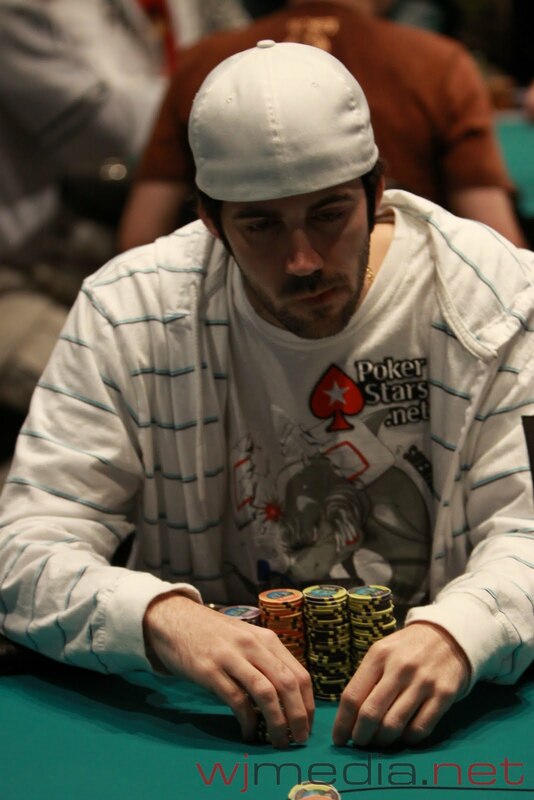 After a moment, Corkins put in 570,000 in chips. 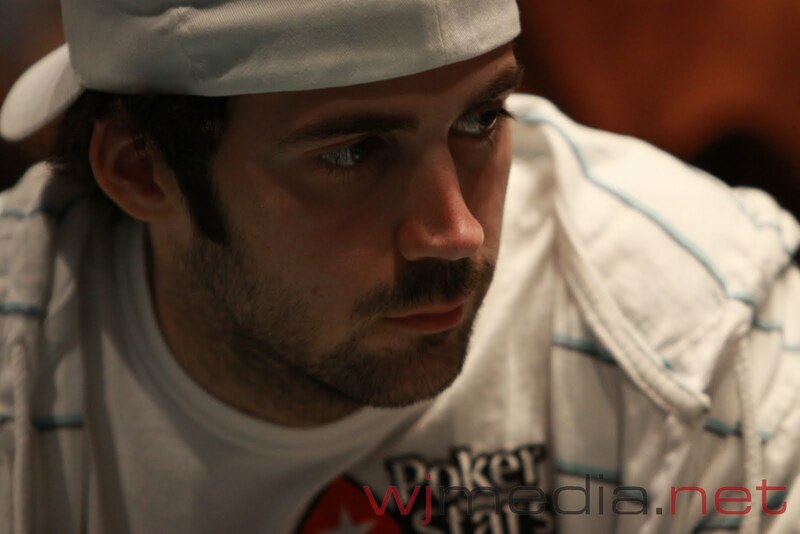 The board ran out [Qs][Td][8c][2h][6h] and Marchese raked in a pot of almost 1.8 million. Corkins is left with just over 300,000 in chips. On a board of [9h][7d][6d], Tom Marchese checked and Hoyt Corkins bet 60,000. 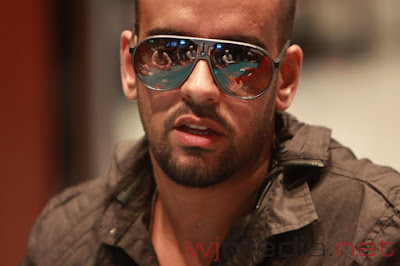 Marchese made the call and the turn was the [8h]. Again, Marchese checked and Corkins bet out 160,000. Marchese made the call once again and the river came the [4h]. Marchese checked once more and Corkins carefully counted out 240,000 in chips. Marchese thought for a minute before slowly sliding out a call. Corkins, ear plugs in full effect, asked if he had called. The dealer said yes and Corkins turned over [Td][Th] for the straight. Marchese mucked and Corkins raked the monster pot. 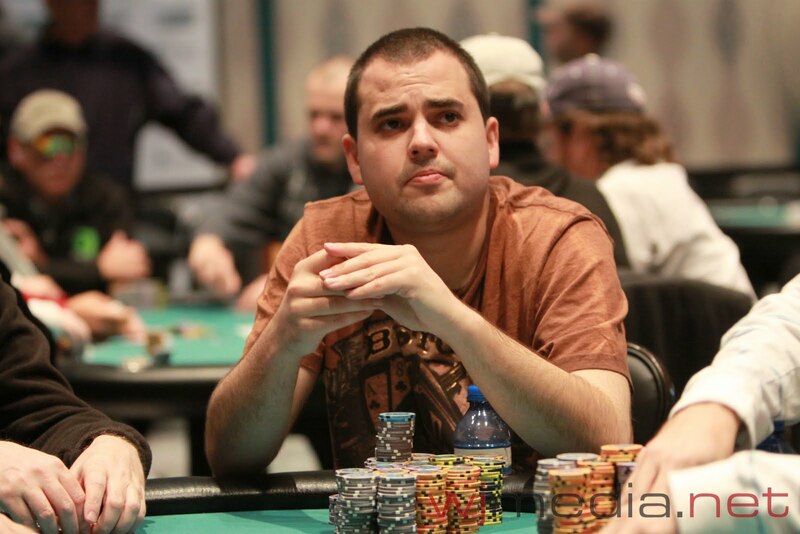 Hoyt Corkins is now up to about 1.15 million while Tom Marchese still has about 900,000. 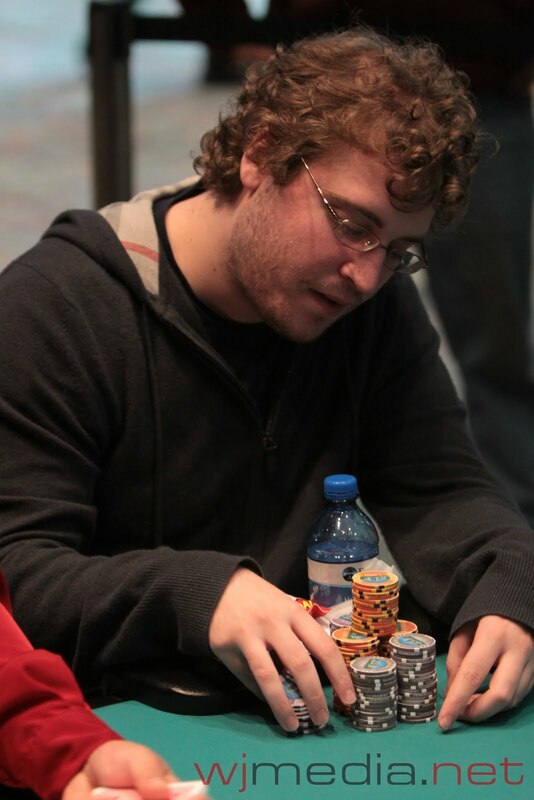 Meskin was behind but quickly caught up on a flop of [Jc][Th][7d]. The turn was the [2h] but the river brought the [9d], giving Yakovenko a set and the pot. 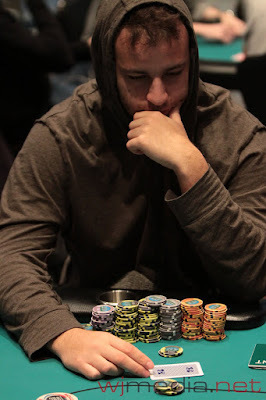 Meskin was eliminated in 13th place. The board ran out [Jc][3c][2s][As][3s] and Inselberg's hand held up to win the pot and eliminate Batkin in 14th place. The blinds have been increased to 6,000-12,000 with a 2,000 ante. Tom Marchese is the current chip leader with about 1.3 million in chips. Sorel Mizzi raised to 23,000 before the flop and David Inselberg moved all in for 115,000. Behind him, Bryon Springer moved all in for only 92,500. The action came back to Mizzi, who asked for the counts. The dealer started to pull in the 23,000 bets and Mizzi ask him to keep them out, saying "I come from the internet and that's how we do it...". The board ran out [Qc][Qs][8c][Jh][9c] and Inselberg's kings held to win the pot and eliminate Springer in 15th place. Chris Hunichen was just eliminated by Nikolai Yakovenko. Huni takes home $33,016 for his 16th place finish. 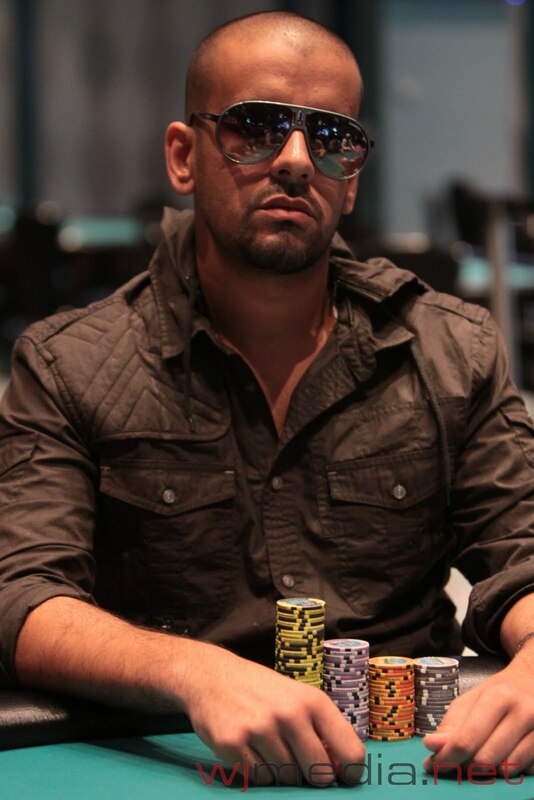 Ronnie Bardah moved all in for less than 100,000 and was called by Sorel Mizzi in the big blind. Bardah turned up [4d][4h] but Mizzi woke up with [Kc][Ks]. 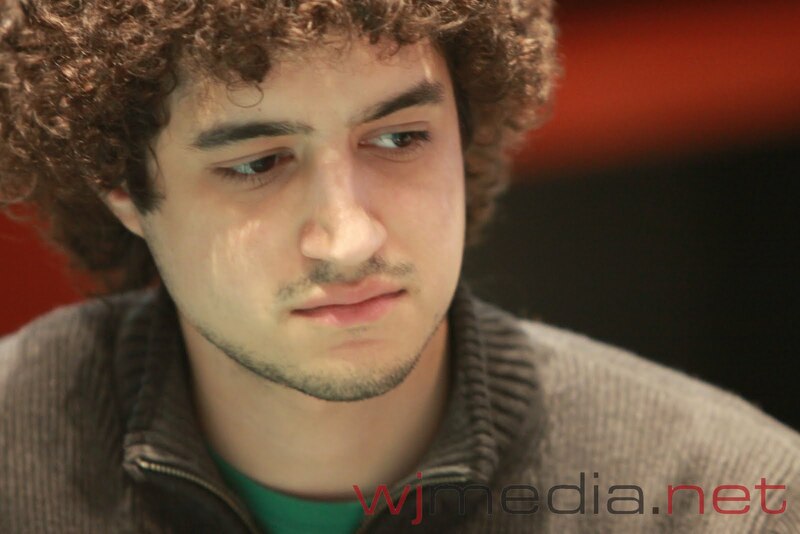 The board came [Qc][Jh][2h][Kh][3s] and Mizzi took the pot to eliminate Bardah in 17th place. Ardavan Yazdi has been eliminated in 18th place and takes home $33,016. 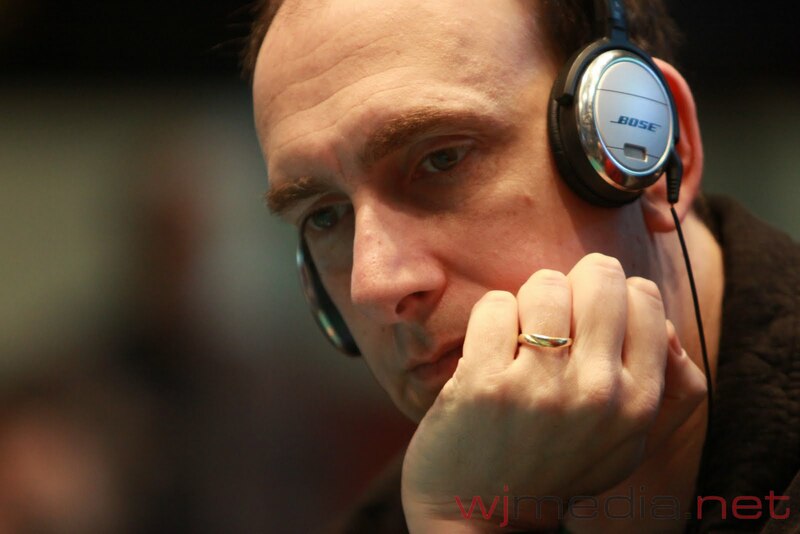 He moved all in with K-Q and was called by Nikolai Yakovenko with A-10. 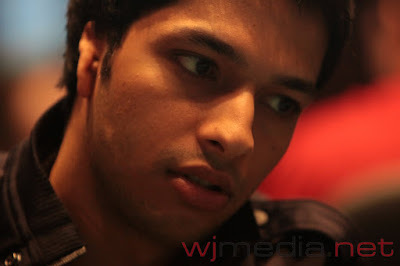 The ace high held up to eliminate Yazdi. Mizzi had an open-ended straight draw but Ziba flopped top set. The turn was the [Js] and the [6s] on the river filled Ziba up to about 540,000. Mizzi still has about 420,000 in chips. 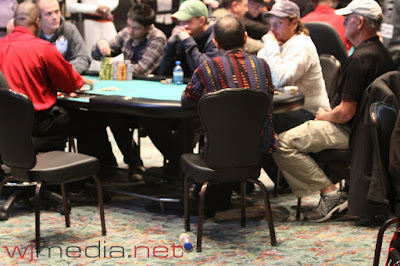 With 18 players remaining, the blinds have been increased to 5,000-10,000 with a 1,500 ante. The board came [9h][5h][4c][Th][Js] and Batkin's sixes hold to double up. Bardah is still left with around 100,000. The flop came [5h][4h][2c] and gave Yakovenko the nut flush draw. The [Kc] on the turn took away some of his outs and the [Ks] on the river ensured the double up for Mercier. Bob Courtney has just been eliminated by Sorel Mizzi. Courtney takes home$33,016 for his 20th place finish. Josh Arieh has just been eliminated by Tom Marchese. The video of the bust-out hand will be posted shortly. The board came [Ah][Qd][6c][9s][Ts] and Mike Beasley has been eliminated in 22nd place for $27,779. The blinds have been increased to 4,000-8,000 with a 1,000 ante. 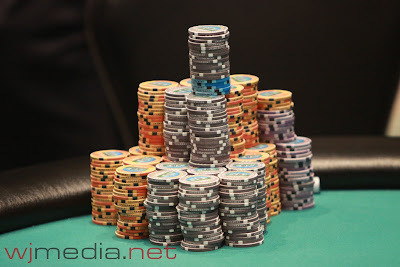 There are 22 players remaining and the average chip stack is 330,000. The final 22 players are now on a 15-minute break. 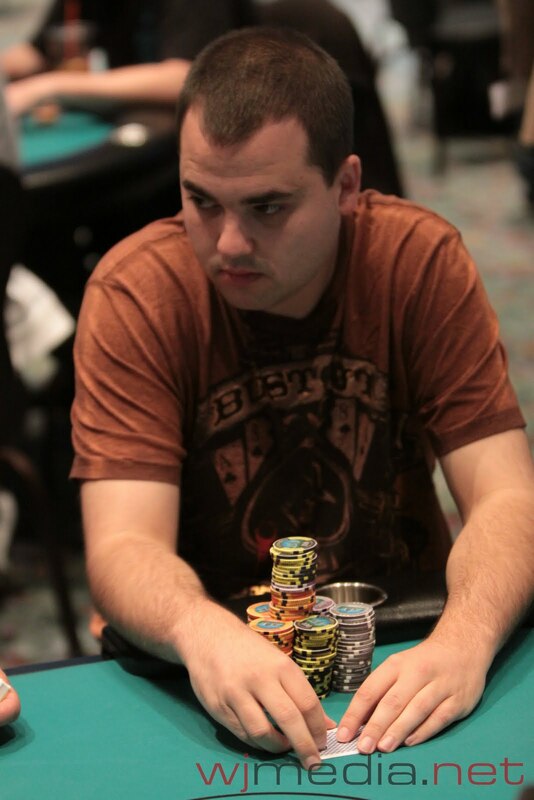 Kyle Bowker has been eliminated in 24th place for $27,779. Happy Halloween From Ronnie Bardah! 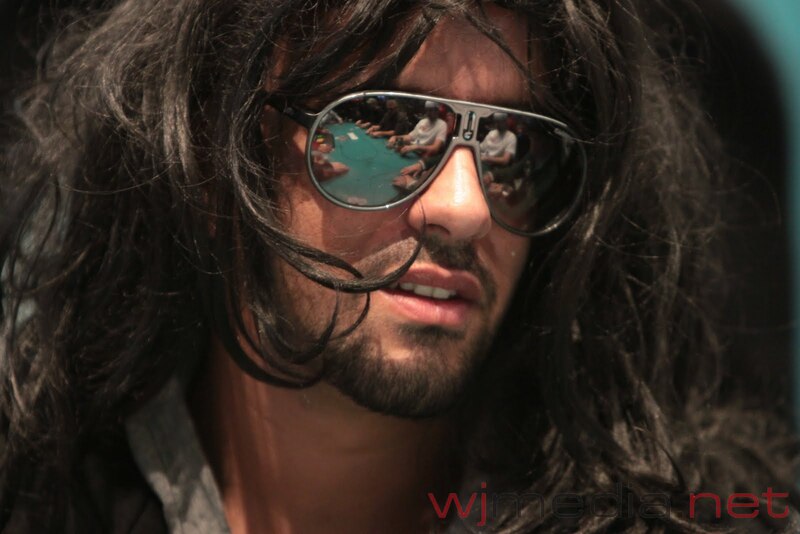 Just after the money bubble burst, Ronnie Bardah borrowed a wig from one of his friends on the rail. On the next hand, he doubled up with pocket nines against A-10 and now refuses to take the wig off. Gavin Smith has been eliminated when his A-10 could not hold up against Nikolai Yakovenko's K-Q after a king hit the flop. 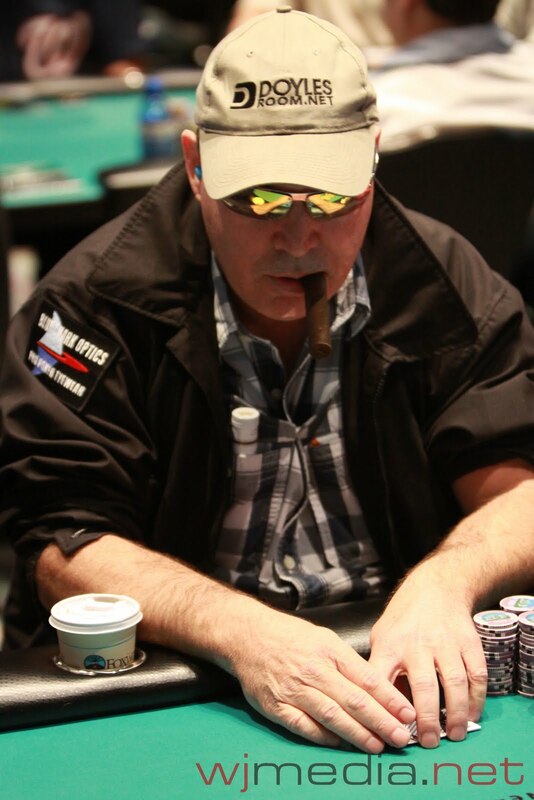 He finishes in 25th place and takes home $27,779. Alex Berger is the Bubble Boy! The board ran out [Jh][8c][4d][9d][9h], eliminating Berger on the money bubble. All players are now guaranteed at least $27,779. Tom Marchese got all in for his last 173,000 with [Ac][Kh] against Nikolai Yakovenko's [As][Qc]. The board ran out [Kc][8c][7d][4s][8h] and Marchese got the double up. Kyle Bowker moved all-in from middle position for 29,500. Hoyt Corkins, in the big blind, asked for a count. It was 23,500 more, and Corkins reluctantly made the call. 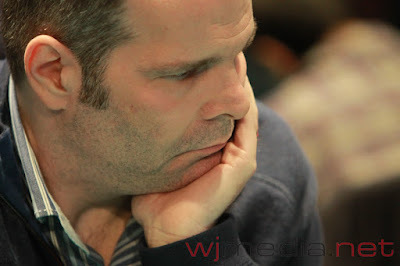 His [Ts][6d] was live against Bowker's [As][9d] but the board ran out [Js][Kh][3c][Ah][Td] giving Bowker a double-up to about 65,000. 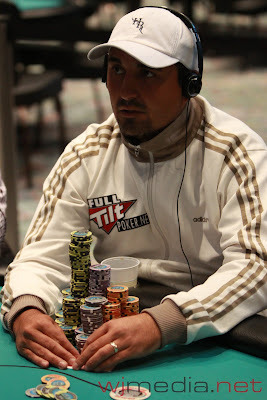 The board ran out [5d][3c][3d][6h][Qs] and Ruffino was eliminated in 27th place. The blinds have been increased to 3,000-6,000 with a 500 ante. With 27 players remaining, play is still hand for hand. The 27 remaining players are now on a 15-minute break. Deja Vu All Over Again? Beasley was way ahead until the flop came [Qs][8d][5d]. 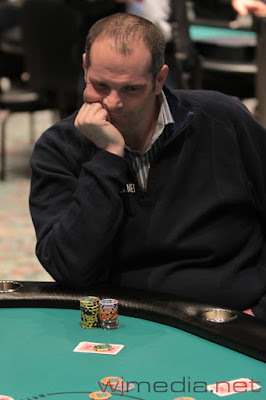 Ruffino took the lead but immediately everyone at the table starts to talk about the Chris Hunichen-Jeff Forrest at the third table. In that hand, Hunichen caught a queen on the flop but Forrest caught runner-runner spades to win the pot. The dealer flipped over the [3d] and it was as if everyone knew what was coming. Sure enough, the [6d] came on the river, giving Beasley the four-flush and a double up to just over 100,000. 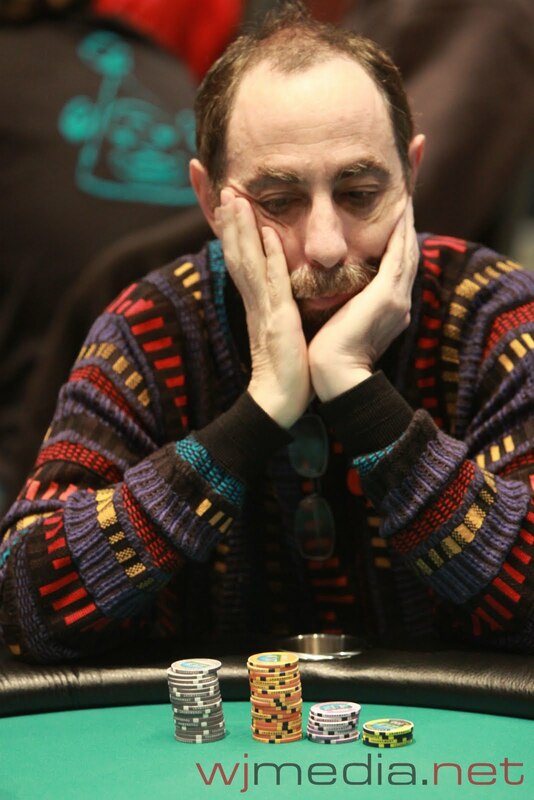 Ruffino is left with under 50,000 in chips. 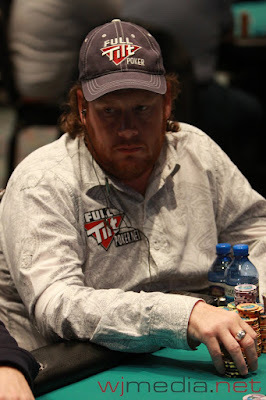 On a flop of [Kc][9s][2h], Gavin Smith checked and Sorel Mizzi bet 39,000. Smith made the call and the turn was the [2s]. Smith checked again and Mizzi fired 58,000. Again, Smith made the call and the river came the [9h]. Smith checked and Mizzi moved all in for his last 104,500. Gavin Smith tanked for about three minutes before finally mucking his hand (He said on Twitter later that he had J-J). When asked to show, Mizzi said "I don't want to embarass him." and tossed his cards in the muck. 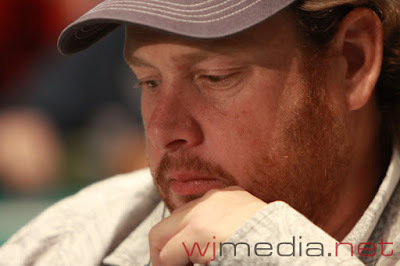 Mizzi is up to almost 400,000 while Gavin Smith drops to about 160,000. Jeff Forrest Doubles to the Chip Lead!!! 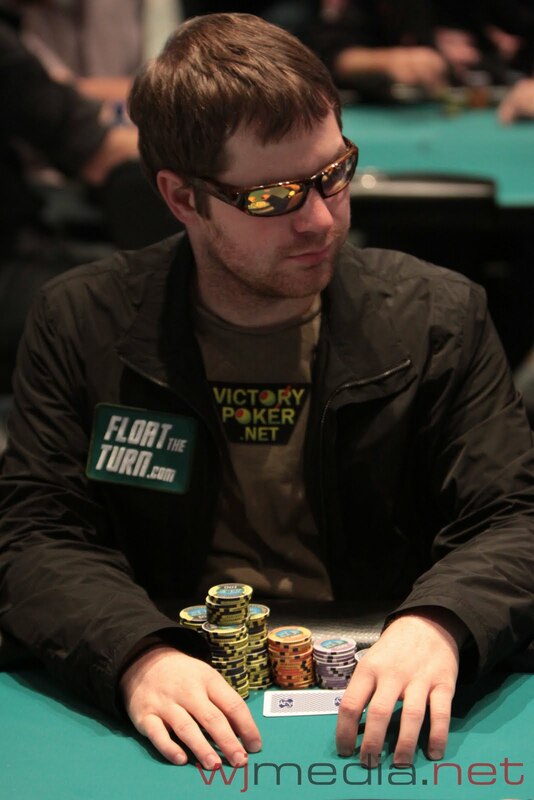 After a series of raise and reraises before the flop, Jeff Forrest finally got all of his chips in the middle against chip leader Chris Hunichen. Hunichen turned up [Qh][Qc], but, for the second hand in row, Forrest turned up [Ah][As]. Hunichen was beside himself as he could not believe that Forrest had picked up aces again. 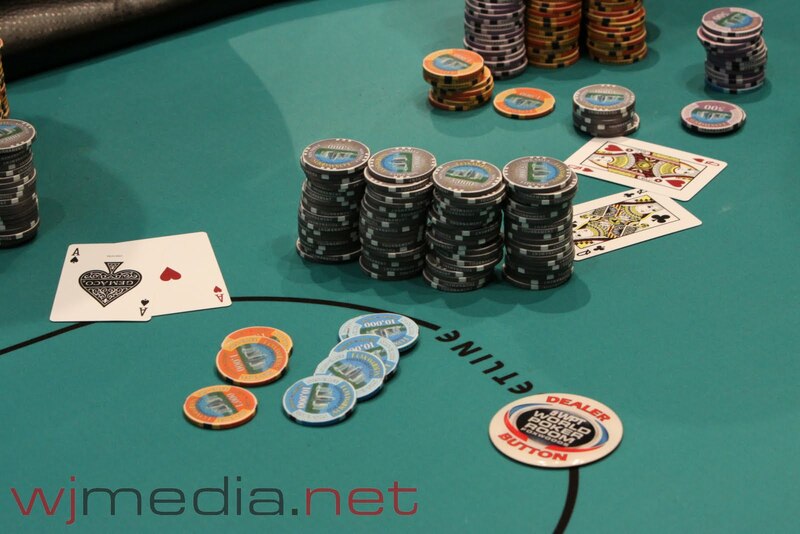 However, Hunichen saw things turn around when the flop came out [Qs][6h][5s]. Hunichen flopped a set of queens to take a huge lead on Forrest. The turn was the [Js] and Hunichen asked the dealer for no spades. Unfortunately for Hunichen, that is exactly what the dealer put out in the form of the [8s]. Forrest caught the four-flush on the river to win the biggest pot of the tournament and he now sits with right at one million chips. 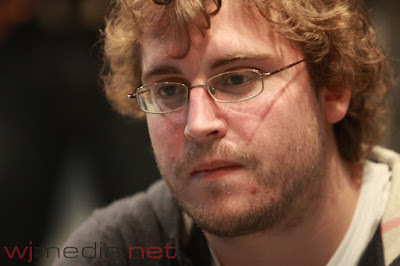 Chris Hunichen is still left with over 200,000 in chips. BJ Nemeth joins Jay "WhoJedi" Newnum to talk about Day Four of the Foxwoods World Poker Finals Main Event. Ardavan Yazdi had not shown up 35 minutes into today's play. However, he did just arrive and has taken his seat at Table 2 and started stacking his chips. There are still 27 players remaining. Ronald Lee was just eliminated early on Day Four. Players are now redrawing for seats at the final three tables. Just click "Watch LIVE Video" at the top of the page to view the live video feed! Play is now underway on Day Four of the Foxwoods World Poker Finals. The blinds are 2,500-5,000 with a 500 ante. Play will continue until we lose one player, then we will redraw for seats at the final three tables. Nearing the money bubble, three players got all in. Amazingly, the had aces, kings and queens. Play has ended for the night on Day Three of the Foxwoods World Poker Finals with 28 players remaining. Play will resume tomorrow at noon. Tournament officials just announced that six more hands will be played this evening and then play will conclude for the day. 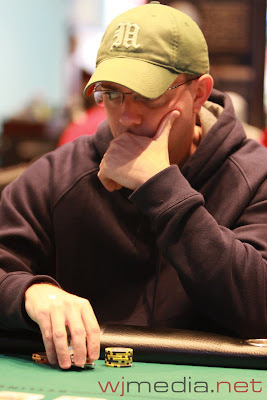 Chris McCormack was just eliminated in 29th place by Gavin Smith. We now have just 30 players remaining in the field. There is just over 30 minutes left in the current level. John Matson moved all in from under the gun for his last 62,200 and got a call from Mohsin Charania. Matson turned up A-Q but Charania flipped up A-A. The board did not improve Matson's hand and he was sent home in 32nd place. 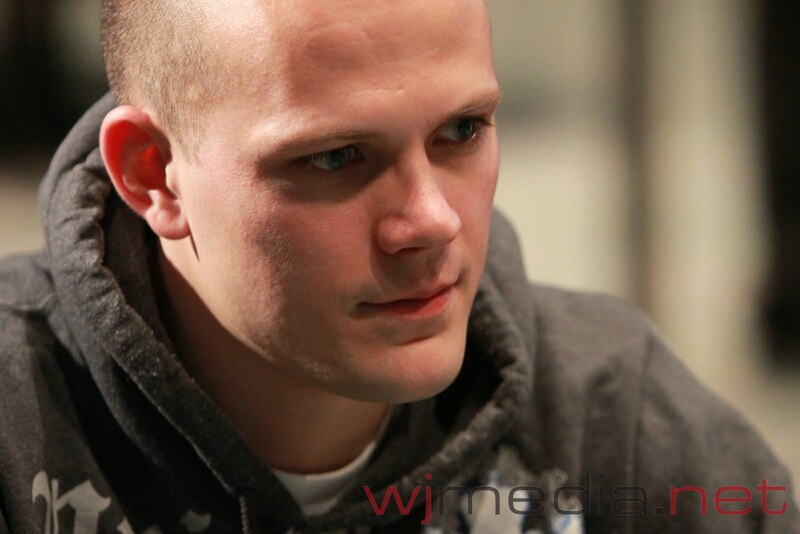 Brock Parker was just knocked out of the Foxwoods World Poker Finals by Ben Klier. 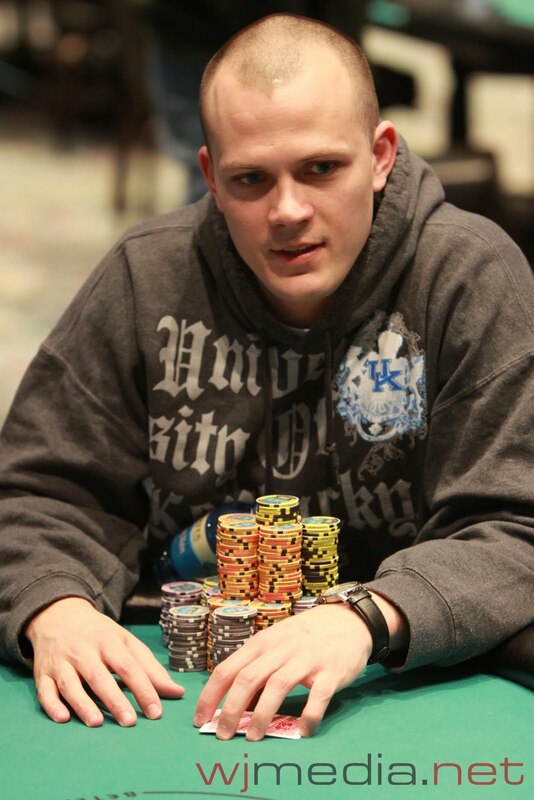 Klier is now well over 500,000 in chips. Break Time with 33 Players Remaining. We are down to the final 33 players. They are now currently on their final 15-minute break of the evening. 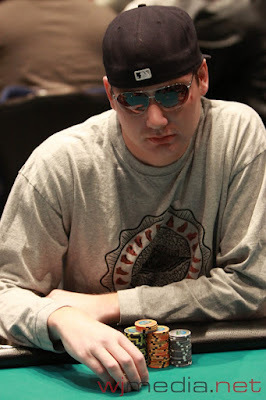 Chris Hunichen Takes the Chip Lead! Chris Hunichen raised preflop and was three-bet by Lance Steinberg. Hunichen made the call and the flop came [9h][4s][3c]. Steinberg bet 30,000 and Hunichen made the call. The turn was the [Kc] and Steinberg checked. Hunichen fired 45,000 only to be check-raised by Steinberg to 100,000. Hunichen thought for a moment and then made the call. The river was the [5s] and Steinberg checked it. Hunichen announced all in and Steinberg immediately made the call. Hunichen asked if Steinberg had a set and Steinberg said no. Hunichen then flipped up [9c][9s] for a set of nines and Steinberg threw his [As][Kh] into the muck. Lance Steinberg is eliminated from the tournament and Chris Hunichen has taken the chip lead with 740,000 in chips. We are now down to the final 36 players and we have only four tables remaining. The average chip stack is now just under 202,000. 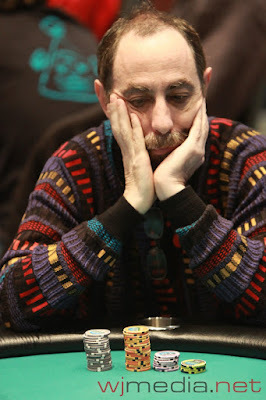 Barry Greenstein sits bookless just moments before being eliminated. The board ran out [Kc][Js][2s][3s][3c] and Hoyt Corkins won the hand, eliminating Greenstein from the tournament. As you can see from the photo above, Greenstein had forgot to bring a copy of his book, "Ace On the River". However, he promised Corkins a signed copy the next time he saw him. 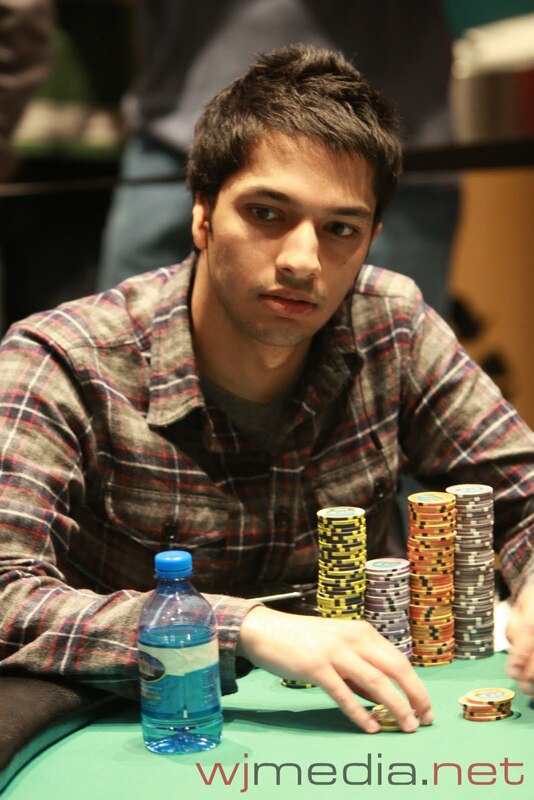 Ben Klier just doubled up to just over 280,000 when his A-K outdrew Mohsin Charania's pocket queens. The chips went in preflop and Klier hit a king on the flop. Mohsin Charania still has right at 300,000 in chips. 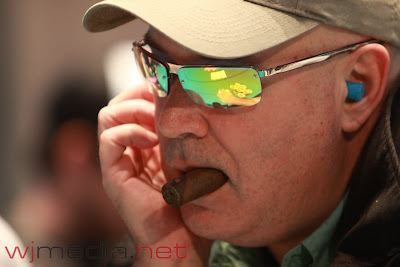 The blinds have been increased to 1,500-3,000 with a 400 ante. Break Time with 42 Players Remaining. The 42 remaining players are now on a 15-minute break. 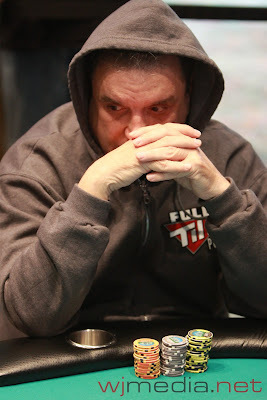 Howard Lederer has been eliminated when Doug Benedict moved all in from the small blind after it was folded around. Lederer, with only about 25,000 in chips, called all in and turned up K-Q. Benedict showed A-10 and Lederer could not improve. Jon Aguiar has been eliminated on Day Three of the Foxwoods World Poker Finals. His pocket aces failed to hold up against his opponent's A-Q off-suit. Allen Kessler has just been eliminated from the Foxwoods World Poker Finals when his [Ac][Kc] was not able to outdraw his opponent's pocket jacks after getting all the chips in the middle preflop. Miami John Cernuto has just been eliminated on Day Three by Hoyt Corkins. The blinds on Day Three of the Foxwoods World Poker Finals have been increased to 1,200-2,400 with a 300 ante. Break Time with 54 Players Remaining. The 54 remaining players are now on a 15-minute break. There are now only 56 players remaining. 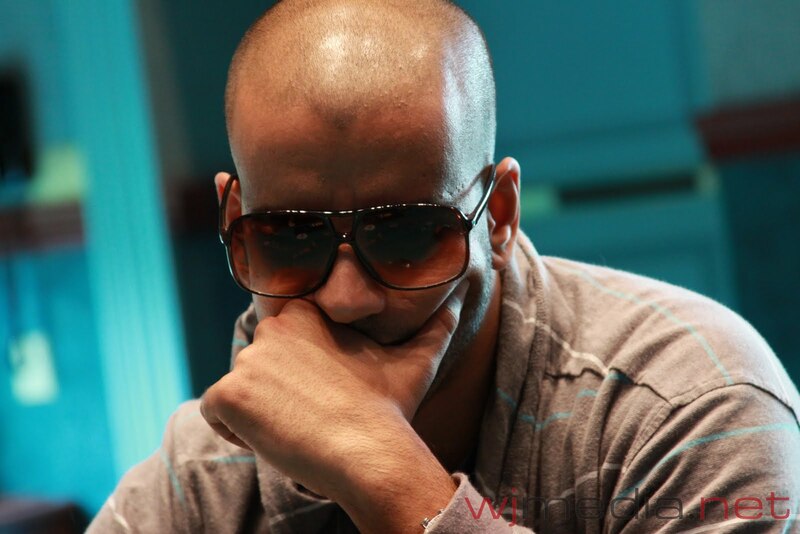 The average chip stack is just under 130,000 with the blinds at 1,000-2,000 with a 300 ante. BJ Nemeth Wins the Foxwoods Media Event! 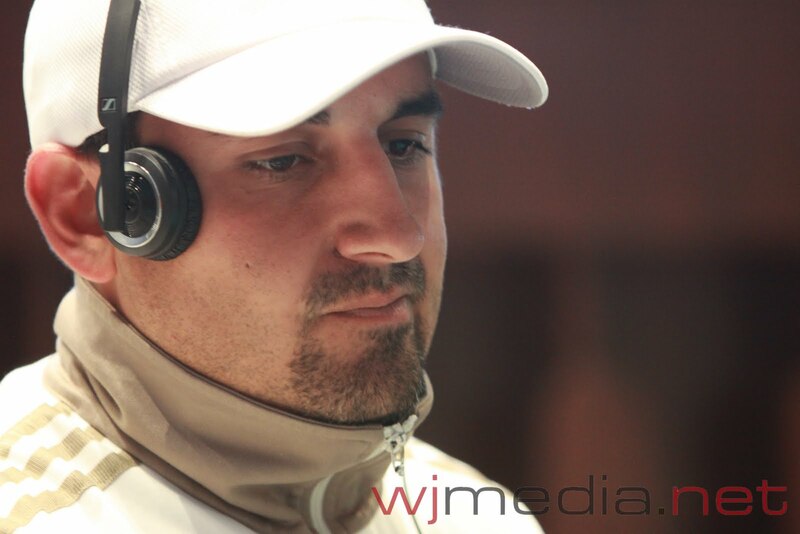 The Foxwoods Poker Room and Bernard Lee put on a special tournament last night the media covering the World Poker Finals. B.J. 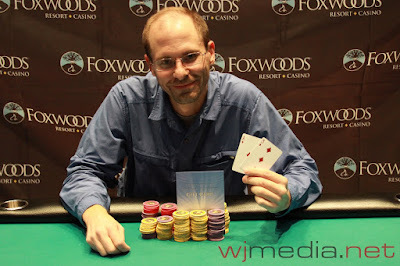 Nemeth ended up winning the heads-up match with Jess Welman to take down the title! Congratulations to everyone that played and thanks again for all the work you do! 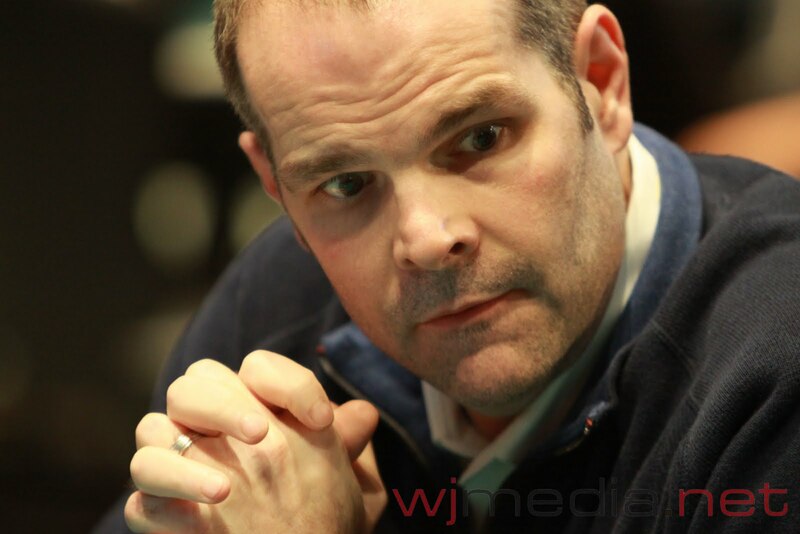 Mike Sexton talks to Jay "WhoJedi" Newnum on Day Three of the Foxwoods World Poker Finals. The 62 remaining players have returned from break and play has resumed. 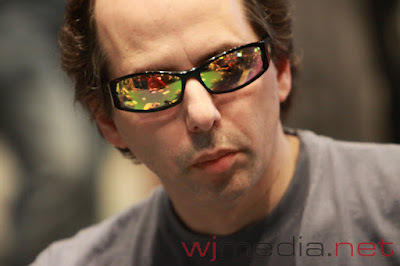 The blinds have been increased to 1,000-2,000 with a 300 ante. On a board reading [Tc][4h][2h][Ks], Chad Brown got all of his chips in the middle against Ben Klier. 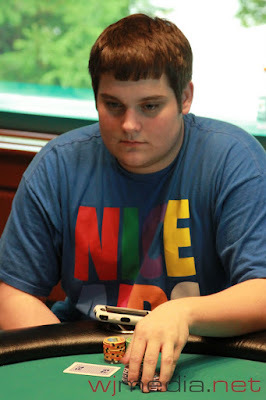 Brown showed [Ks][Tc] for two pair to lead the [Ad][Ac] of Klier. However, the [4s] fell on the river, giving Klier a better two pair and the pot. 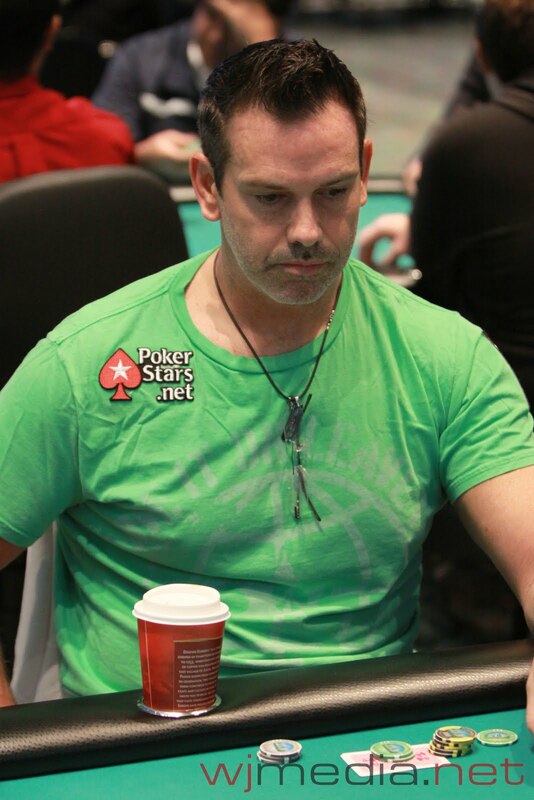 Chad Brown was eliminated from the Foxwoods World Poker Finals and Klier is now up to almost 360,000. 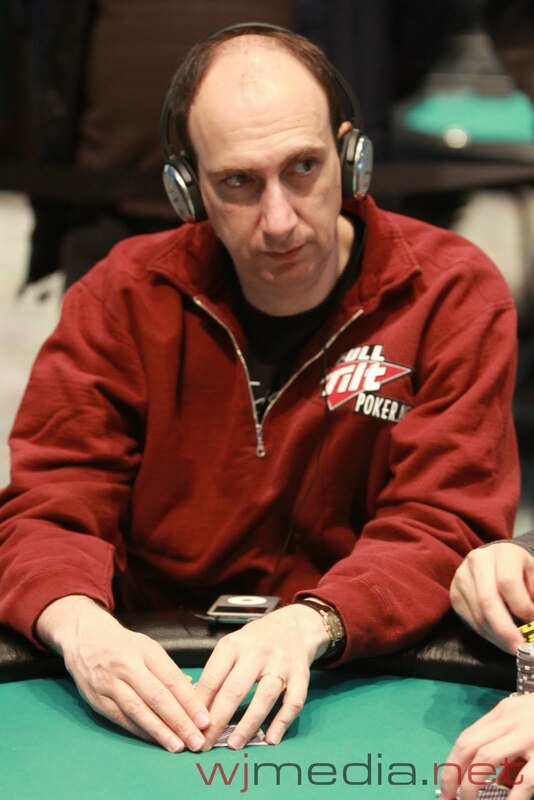 Erik Seidel has been eliminated early on Day Three action at the World Poker Finals. 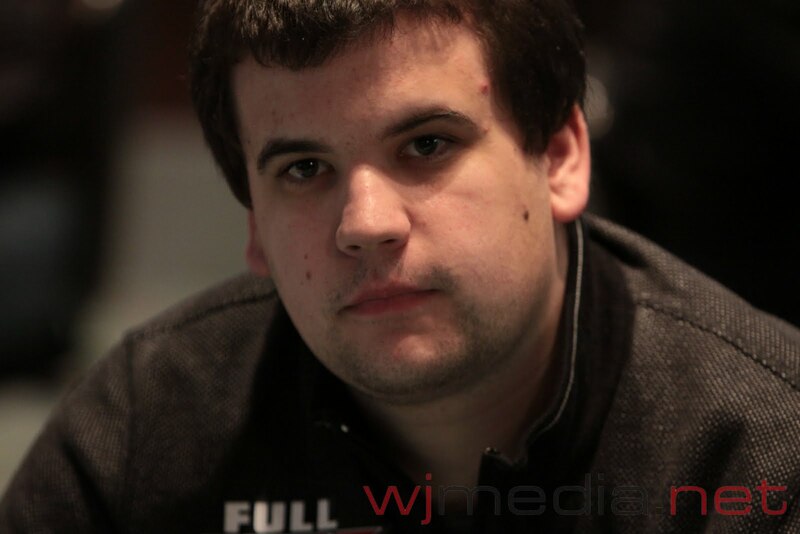 His pocket queens were unable to improve against the pocket kings of Nikolai Yakovenko.